We defend and prosecute cyber smear and internet defamation cases throughout the Chicago area including near Schaumburg, Aurora, and Wheaton. We have defeated claims against our clients with a number of creative defenses founded on the First Amendment, Innocent Construction or personal jurisdiction defenses. We have also prevailed against such defenses for our clients who have pursued defamations and slander claims. We have obtained removal from the internet of commercially defamatory reviews against our business and professional services clients such as doctors and lawyers posted on internet review sites such as Google and Yelp. You can view here a decision in an internet defamation case involving a negative review on the Rip-Off Report where we successfully defended our client by obtaining a dismissal based on lack of personal jurisdiction. For a detailed discussion of the personal jurisdiction defense in internet defamation cases, you can go to our website. You can view here a Yelp review by our client who was wrongfully sued for negative Yelp and other reviews against a daycare center that had been closed down by the Department of Children and Family Services for alleged negligent care of young children. Defamation is the general term for a legal claim involving injury to one’s reputation caused by a false statement of fact and includes both libel (defamation in written or fixed form) and slander (spoken defamation). The crux of a defamation claim is falsity. Truthful statements that harm another’s reputation will not create liability for defamation (although they may open you up to other forms of liability if the information you publish is of a personal or highly private nature). Defamation in the United States is governed by state law. While the U.S. Constitution sets some limits on what states can do in the context of free speech, the specific elements of a defamation claim can — and often do — vary from state to state. Accordingly, you should consult your state’s law in the State Law: Defamation section of this guide for specific information. There are many defenses to defamation and slander claims. Our lawyers concentrate in this area and can provide our clients — both plaintiffs and defendants — with considerable resources to guide their claims through the intricacies of these defenses. You can go our two websites to learn more about theses defenses here and here. Here is a video regarding a client we defended in an internet defamation claim. We settled federal court case in favor of our client after we filed a sanctions motion against the used car dealer plaintiff for filing an allegedly false lawsuit; our client received a full release and all of his videos and negative video reviews remained on the internet after we won an arbitration proceeding against the dealer which was part of the settlement of the federal court suit dismissing all of the claims. Here is a newstory about the case. There is no issue that Claimant has engaged in false advertising. [It’s owner] has admitted as much and more, including submitting a false affidavit in litigation antecedent to this arbitration. Judgments and pleadings are public records; disseminating this information that is part of a public record is not actionable. In addition, the fact of entry of judgment provides a colorable foundation for the opinions and conclusions published by Bates. As much as the Claimants would like to explain away these events, and as minor a part this conduct has played in comparison with the totality of business operations, the facts are what they are; once in the public domain these facts can be both circulated and commented on. In addition, insignificant errorata is not actionable in any event, and it is conceded that many postings are of this character. Our Chicago defamation attorneys defend individuals’ First Amendment and free speech rights to post on Facebook, Yelp and other websites information that criticizes businesses and addresses matters of public concern. Our Chicago Cybersquatting attorneys also represent and prosecute claims on behalf of businesses throughout the Chicago area including in Lincolnwood and Wheaton who have been unfairly and falsely criticized by consumers and competitors in defamatory publications in the online and offline media. We have successfully represented businesses who have been the victim of competitors setting up false rating sites and pretend consumer rating sites that are simply forums to falsely bash or business clients. We have also represented and defended consumers First Amendment and free speech rights to criticize businesses who are guilty of consumer fraud and false advertising. Super Lawyers named Chicago and Oak Brook business trial attorney Peter Lubin a Super Lawyer in the Categories of Class Action, Business Litigation, and Consumer Rights Litigation and Chicago slander attorney Patrick Austermuehle a Rising Star. 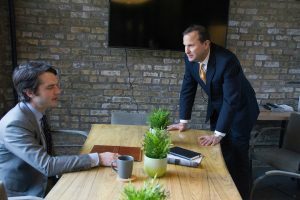 Lubin Austermuehle’s Oak Brook and Chicago business trial lawyers have over thirty years of experience in litigating complex class action, consumer rights, and business and commercial litigation disputes. We handle emergency business lawsuits involving injunctions, and TROS, defamation, libel, and covenant not to compete, franchise, distributor and dealer wrongful termination and trade secret lawsuits and many different kinds of business disputes involving shareholders, partnerships, closely held businesses and employee breaches of fiduciary duty. We also assist businesses and business owners who are victims of fraud or defamatory attacks on their business and reputations. Lubin Austermuehle’s DuPage County defamation and slander lawyers near Lake Forest and Winnetka have more than three decades of experience helping business clients unravel the complexities of Illinois and out-of-state business laws. Our Chicago business, commercial, class-action, and consumer litigation lawyers represent individuals, family businesses and enterprises of all sizes in a variety of legal disputes, including disputes among partners and shareholders as well as lawsuits between businesses and consumer rights, auto fraud, and wage claim individual and class action cases. In every case, our goal is to resolve disputes as quickly and successfully as possible, helping business clients protect their investments and get back to business as usual. From offices in Oak Brook, near Lincolnwood and Oak Park, we serve clients throughout Illinois and the Midwest.